For an overview on OwnerRez Widgets, widget setup, etc. look at the Setting up widgets for inquiries, bookings and availability. Note: this guide is oriented around setup of widgets for a couple of properties. If you've got many properties and want a parameterized setup that is possible but a bit more complex. Contact us and we'll walk you through that process. These steps assume you've already created a page where you want to embed OwnerRez widgets. If you have the WiX hotels app installed, you may want to remove that by deleting the Rates & Availability page. Copy the widget code from the OwnerRez widget and paste it in to the Content box. Click Update to save the widget. 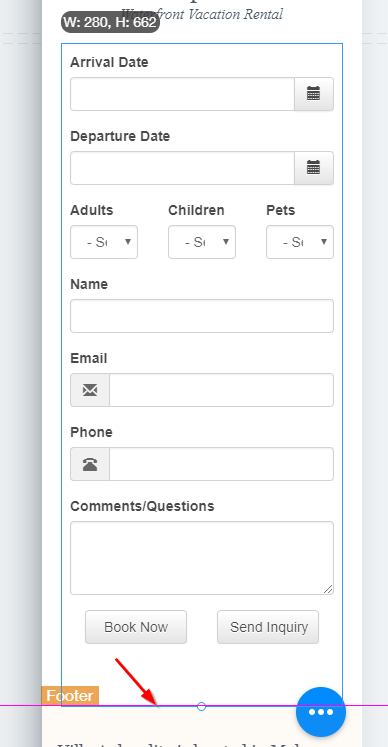 Resize the box so there is plenty of room, particularly vertical room to display validation errors and quotes. The WiX editor traps the OwnerRez widget so we can't auto-resize, so whatever space you give will be the max space available to the widget. Grab the resize bars for the widget and give it enough space. Again, we can't auto-resize on the widget because of how Wix lays out their templates, so make sure to give it plenty of space.